Located 5.5 km from Siem Reap, Angkor Wat is the largest monument of the Angkor group and still well-preserved. Moreover, it is also the largest religious monument in the world. 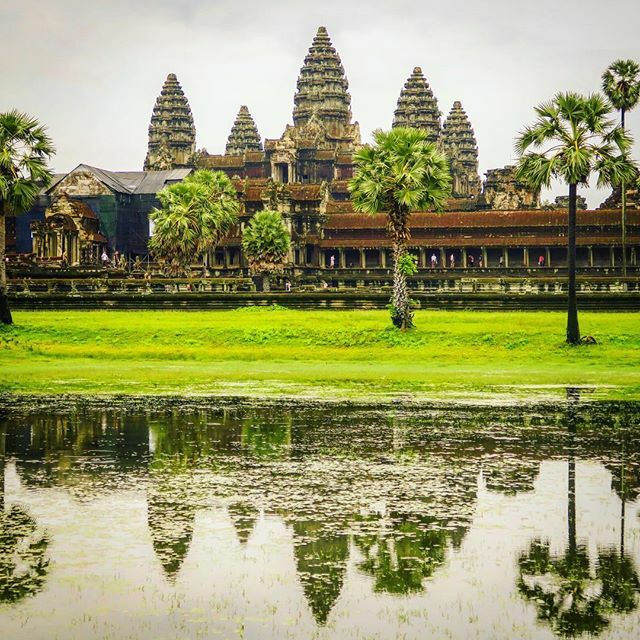 Nowadays, Angkor Wat is an iconic image of Cambodia that represents the glorious period in the Cambodian history. You can not show off that you have come to Cambodia if you miss these relics. 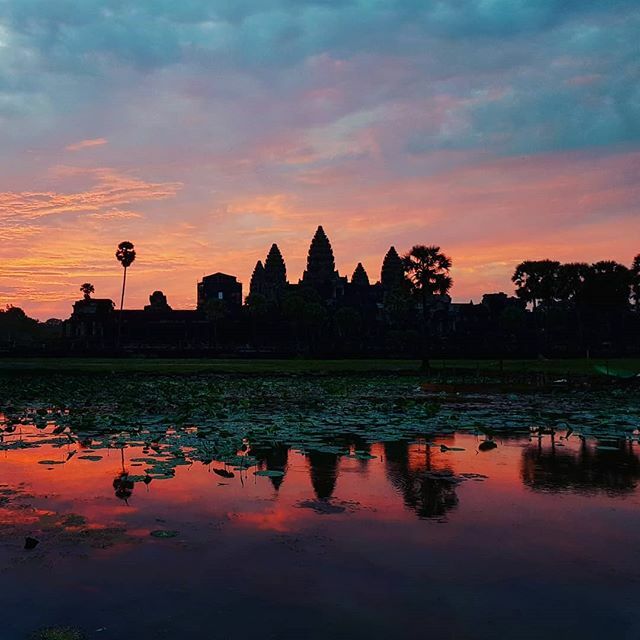 Watching Angkor Wat sunrise will definitely be one of the most serene things to do in Siem Reap. 4. 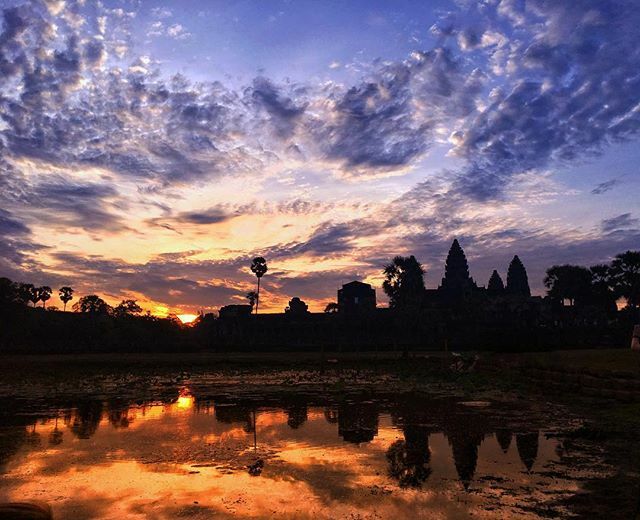 Will Angkor Wat sunrise satisfy your wanderlust? 5. 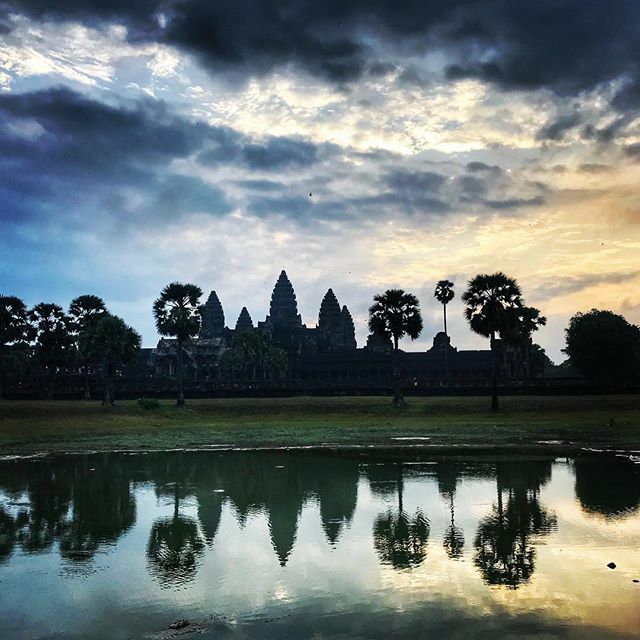 How can you enjoy the Angkor Wat Sunrise? 6. How can you get there? Angkor Wat is a part of the Angkor complex. 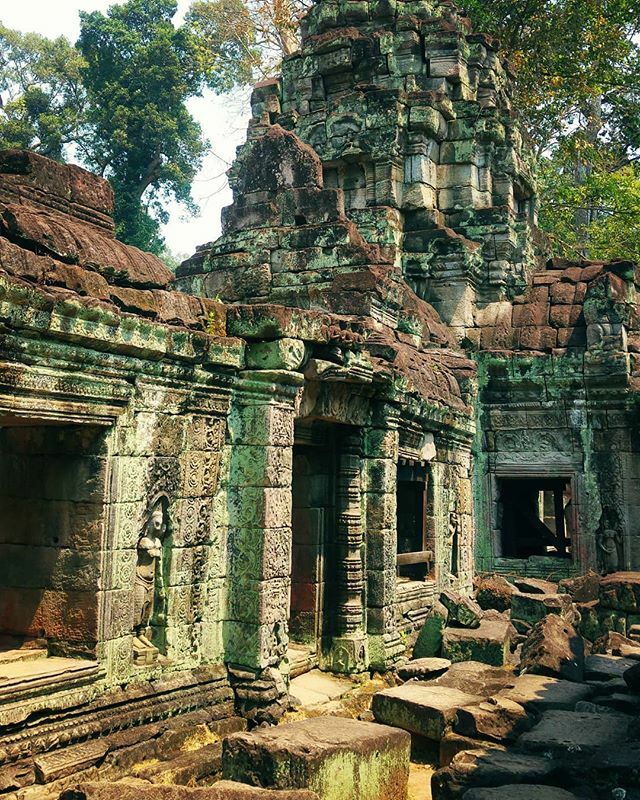 This temple was built by the King Suryavarman II in the capital of Khmer Empire in the early XII century. Different from other previous temples that were dedicated to Shiva – God of Destruction, Angkor Wat was dedicated to Vishnu – God of Protection. King Suryavarman built this temple to be not just a monument but also his tomb when he passed away. At the end of the XII century, this temple transformed into a Buddhist temple. This temple became the symbol of Cambodian pride and appears on the Cambodian national flag. Angkor Wat was built with sandstone blocks from a mountain of Phnom Kulen. These sandstone blocks were transported by the craftsmen on the Siem Reap rivers. Because of this difficult process, building Angkor Wat required a large number of people. Surrounding around Angkor Wat is a moat by 650-foot-wide (200 m). This moat helps stabilize the foundation of the temple and prevent the groundwater from rising too high or falling too low. It also contributes to the preservation of the temple because thank to this moat, invasion of the temple was quite difficult. 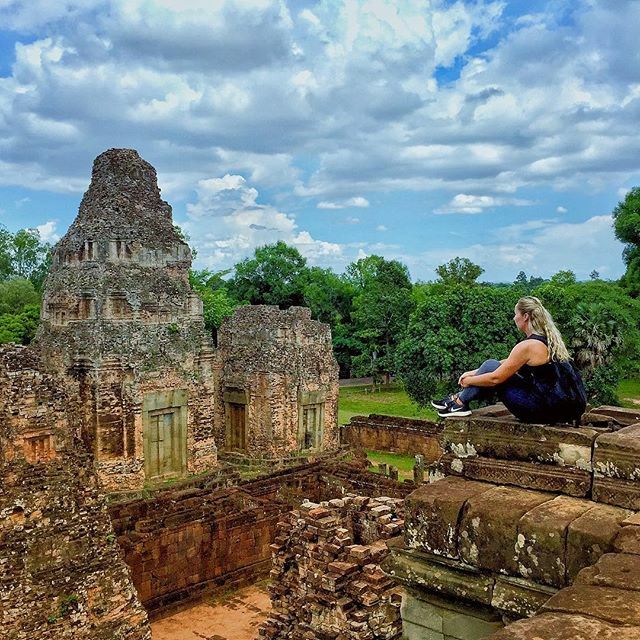 Visit the spectacular Angkor Wat with Inspitrip now! After going through a steep stairway, you will reach to the heart of the temple – the central tower. Five parasats (towers) of Angkor Wat are built on three terraced levels. The central parasat is built on the highest place of these terraced levels and stands out from other parasats. The four remaining parasats are on the second level – lower than the main one. The experience when you witness the transformation of the dark into a bright day will be one of the most unforgettable memories in your life. How can anything be more wonderful than a moment when you see the first rays of sunlight emerge on the majestic temple? Because the temple faces the west, every morning the sunrise rises over the back of the temple. The Angkor Wat sunrise will offer you not just an epic view but also spiritual refreshment. At that moment, you will recognize how the human is so small compared to nature. You will freeze breathlessly in front of the natural beauty and admire the beautiful nature. The lucid sunlight that covers the epic Angkor Wat will bring you a powerful, sacred and pure feeling that will be carved deeply in your mind. You should go to the temple early. Don’t think that because you go there at sunrise there won’t be a crowd. 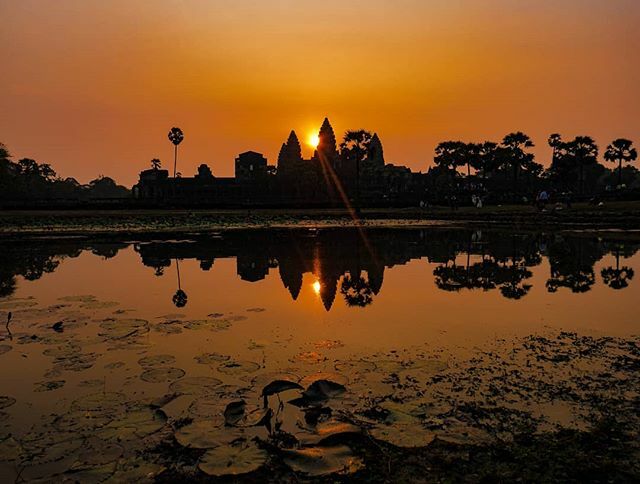 The sunrise in Angkor Wat is claimed as one of the most beautiful sunrises that you can see all over the world. So don’t be surprised if you come here and see there are many people who came here even earlier. The standing spot will affect your vision so you should be one of the first people come here. Angkor Wat will be open at 5 pm, therefore, it will be a clever choice if you leave your hotel before 4:45. You should buy the ticket the day before the sunrise because it will save your time instead of standing and waiting after a long queue. The best place to enjoy the perfect sunrise is from the reflection pond in front of the main temple. You should stand close to the water’s edge so that no one can cut the line and take your spot. From this place, you will see the sunrise and its reflection on the pond. Beside the pond, you also can choose Angkor Hill to see the sunrise. In contrast to the pond with many people, the Angkor Hill will offer you a good view of sunrise and also peace and silence. If you are a person that loves peaceful experience, this is the place you should choose. You should go there by tuk-tuk – a popular mean of transport in Cambodia. If you want to go there on time, you have to tell the driver to go to the hotel and pick you up early. The tuk-tuk will drive you through the dark to the temple. Don’t forget to tell your driver to go into the bright road instead of the dark roads without lights. There are 3 ways to go there so the drivers will know the way you mentioned. There will be a lot of difficulties you have to face if you want to enjoy the trip completely. Accommodation and transportation can cause problems if you do not know how to get the best one. 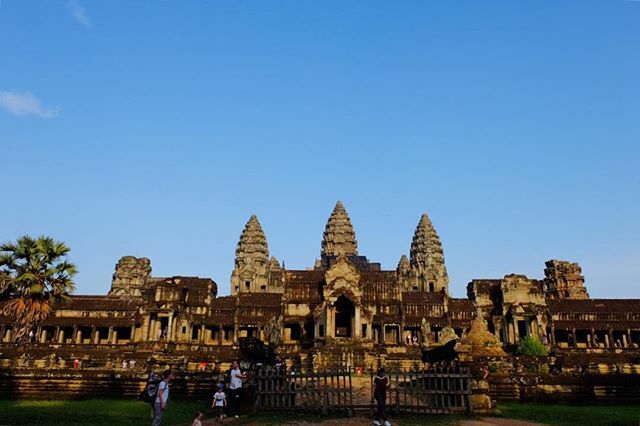 Although tourism has developed in Cambodia especially in the area around Angkor complex, finding a hotel with an acceptable price as well as close to the temple is not an easy work. Besides, buying a ticket to Angkor Wat is also a choice that you need to consider. Don’t buy the ticket indiscriminately if you do not want to get a higher price. If you think that the tickets you buy from the receptionists of the hotel are in good-price, you are wrong. Because of these above reasons, booking an Angkor Wat tour is the perfect choice. You don’t have to worry about anything, the tour will cover all things you need. From the accommodations, transportation, to the tour itself, it’s a much less stressful way to maximize your experience. Your job is just to enjoy your trip and take beautiful pictures to capture the wonderful memories. You should know that you will walk a lot when you visit this relic. This complex is very big and the different elements of the complex are also far from each other. Don’t wear high heels. Don’t forget to bring water. You will need at least 3 days to explore Angkor Wat complex so you should buy the ticket for your whole trip. It will help you save time. Besides, list out the temples that you want to visit, do not go randomly because it will waste a lot of time. January is the best month of the year that you should visit Angkor Wat. It is not too hot so you won’t feel uncomfortable while walking around. If you want to try something more challenging and adventurous, riding a bike is quite fun. If you go with a friend, a bike is enough for two of you to explore every corner proactively. It will cost about 30-40$/day included tuk-tuk and food. It is not expensive to try the local food in Siem Reap. Angkor Wat is a holy and sacred site in Cambodia and the monks often visit this temple so you should wear clothes that cover your knees and your arms to respect their culture. For some temples, if you do not cover your knee and shoulders, they will not let you come in. 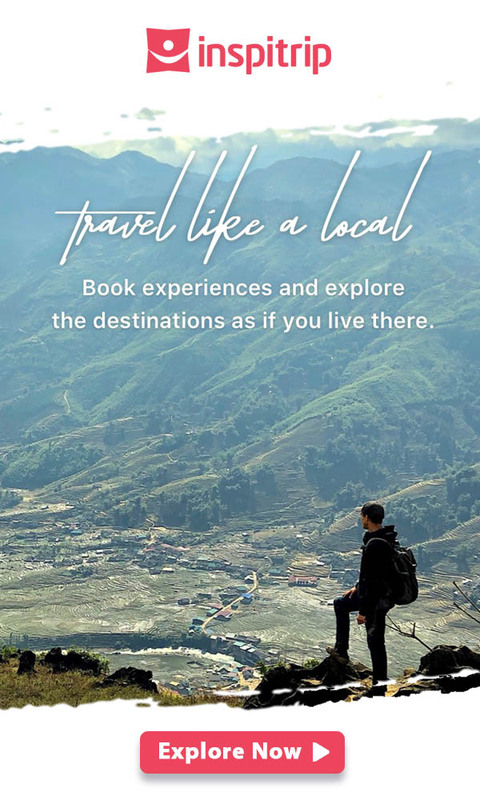 Find a local tour guide or book a tour that includes a local tour guide. They will help you a lot and it is for sure that who know this place as well as the local guide?